Diamond is a 3-year old American Quarter Horse Gelding that is a working cow horse and competes in reining competitions. During one of his competitions he fell before the finish line. 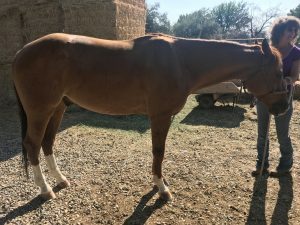 The owner has changed the shoes as well as increased feed to free feed all day as well as had their veterinarian examine Diamond and perform general bloodwork, which was normal. Diamond was not referred by the veterinarian, rather was referred by a mutual friend that thought acupuncture may be a good adjunctive therapy for Diamond. Diamond received three acupuncture treatments. All treatments were based on myofascial exam and predominately treated taut bands and relaxation points. Diamond is a 3-year old American Quarter Horse Gelding that is a working cow horse and competes in reining competitions that undergoes intense training for these competitions. The owner became concerned about Diamond after he tripped and fell at the end of a competition in late July early August 2018. Diamond recovered quickly from the fall and trotted out of the arena with no apparent abnormalities. This was about a month prior to my initial examination. The owner had made quite a few changes prior to my examination. These changes included changing feeding from twice a day to a free-fed schedule; farrier examination and changing shoes and angles of toes; and veterinarian examination, which resulted in no abnormalities noted. In addition to being free fed, Diamond is given a vitamin supplement daily as well. The owner’s goal for Diamond were to help Diamond win competitions. The owner does report that some days, first thing in the morning, Diamond will ‘high-step’ a hind leg, reporting that it appears to be the left most frequently. Over the last year, Diamond has been worked almost daily with basic reining skills and working cow exercises. Diamond will get breaks a day or two before a competition and then get a day or two rest following a competition. Diamond is a very muscular, young, athletic horse. Normal pulse and respiration were appreciated with each examination and treatment; body temperature was not evaluated. No bloodwork was evaluated; although previous bloodwork from Diamond’s veterinarian was reportedly normal. The first examination, Diamond did not exhibit an abnormal gait or picking up of a hindlimb (as the owner described sometimes happens), albeit, I have a lot of improving yet to do with my lameness exams. It should also be noted, that the first examination was after the owner had already worked Diamond. Overall, treatments went well, mainly treating trigger points during examination and focusing on relaxation points. I believe the change in shoes and feed have immensely helped Diamond in competition. Diamond is a very large muscled horse, particularly in the quadriceps and hamstrings. Overall, healthy horse with history of inadequate daily caloric intake. I feel that overall, Diamond is a healthy young horse that was fatigued or exhausted during competition due to inadequate nutrition and possibly shoes and toe angle. The concerning event of tripping and falling only happened once and was during competition, which I believe have added stresses for the horse. Since the event, the owner has made nutritional changes and shoe changes and Diamond has been doing well. Examinations did not reveal any neurological abnormalities. Diamond did not appear to have any abnormal neurological findings on examination; treatments were based on myofascial examination and trigger points. Stretching exercises were implemented for Diamond before working and competitions as the owner reported that first thing in the morning Diamond had a tendency to high-step in the hind-end sometimes; stretching exercises included extension and flexion of the hindlimbs and forelimbs. Diamond: August 30th, 2018: This was the first treatment and my initial plan was to utilize a couple of relaxation points to evaluate Diamond’s response to having needles placed. Following my examination and myofascial examination, I did not feel too many more points were needed during this first treatment. My first point was Large Intestine (LI) 16 on the left side and then LI 16 on the right side. There was a small taut band close to insertion of LI 16 on the right and following the treatment that was no longer palpable. I also placed a needle in Bai Hui. 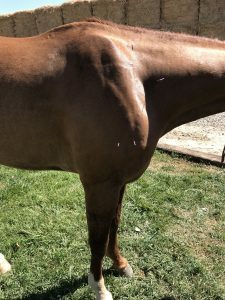 Although, I did not necessarily evaluate trigger points or abnormalities on the hind end, Diamond is such a large muscular horse that is required to perform quick stops and I felt that Bai Hui would help with any underlying back or hind-end soreness. September 4th, 2018: This was the second treatment for Diamond and followed a morning workout. Myofascial examination revealed trigger points along the right shoulder area with some tightness in movement compared to the left shoulder. There were trigger points in the supraspinatus and infraspinatus muscles on the right side. LI 16 was utilized on the left and right sides again as was Bai Hui. Triple Heater (TH) 14 was utilized on the right side as well to address the shoulder trigger points. Bladder (BL) 11 was also utilized on the right side to address the shoulder tension. September 12th, 2018: This was the third treatment Diamond and this was treatment was before he was worked mid-morning. Treatment points included LI 16 on the left and right and Bai Hui. I could not appreciate trigger points on myofascial examination and decided on relaxation points again for Diamond. Needles used: I used the following acupuncture needles for all three treatments: Seirin J type 0.25 x 40mm. First treatment: Diamond became very relaxed, he is already a very well-tempered young horse and very good to work with. Subsequent treatments with Diamond included treating the few trigger points found but mostly relaxation points. The second treatment revealed more during my examination then the other examinations. There was some shoulder tension in the right shoulder and a couple of trigger points in the right shoulder area. Following the treatment, the trigger points were no longer palpable and the tension in the right shoulder appeared to have been relieved. The third treatment was tailored to relaxation points following the myofascial examination. Diamond was also heading to a big competition that weekend. Diamond is a hard-working young horse that has a lot asked of him. Overall, I would say that Diamond appeared to thoroughly enjoy the acupuncture treatments. Diamond was a great first equine patient, he is a very calm, well-mannered young horse. I am still trying to gain confidence in my overall examination of the horse for particular lameness and abnormal gaits. Overall, I feel that Diamond is such a powerful, young horse that I think he was just overworked. The owner was happy with the treatments. I liked this case, as I feel it shows that veterinary acupuncture has a place in the maintenance and overall, comfort of an animal competing. Initially, I felt like I should be finding something really abnormal on examination of Diamond, because he fell during competition. However, the owner had really done his homework and was doing everything possible to help Diamond be the best competitor he could be with changing nutrition, addressing the shoes and implementing stretching exercises. Each myofascial examination revealed different trigger points, which really helps support the importance of treatments based on the overall examination and myofascial exams for each treatment.